(Nanowerk News) Chameleon skin and some type of fish skin are regarded as the prototype of structurally colored materials that change their color appearance upon external stimuli, which can be light and dark transitions or other environmental factors. In artificial structurally colored soft materials, temperature variation can be the stimulus, causing the swelling or shrinking of the structure. Yukikazu Takeoka and his colleagues from Nagoya University have created a hydrogel templated on amorphous arrays of fine silica particles that, like chameleon skin upon excitement, promptly responds to temperature variations by volume changes ("Thermally Tunable Hydrogels Displaying Angle-Independent Structural Colors"). "The fast response is attributed to the interconnecting pore structure generated from the colloidal amorphous array," the scientists explain. However, incoherent scattering in these novel thermosensitive hydrogels prevents the structural colors from being visible, making their surface appearing just white. 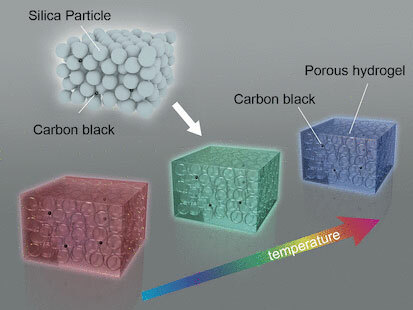 Therefore, the scientists added a very small amount of carbon black to their amorphous colloidal silica arrays. "As a result, we can observe structural colors from colloidal amorphous arrays due to the enhancement of the structural color saturation by reducing the incoherent wavelength-independent scattering of light across the entire visible region," they explain. The carbon black doping was also preserved in the thermosensitive hydrogels prepared from the colloidal silica arrays. The scientists observe: "The hydrogels with a carbon black content of less then 0.1% could display brilliant structural colors, which change with their volume for different water temperatures." As the colors vary from dusty red to green and blue, the novel carbon black doped hydrogels can be seen as a new type of tunable structurally colored soft material. The most important feature of these structurally colored soft materials, however, which makes them applicable even to full-color displays, is the independence of the structural color from the measurement angle. The angular dependence has hampered their use in displays, although tunable colors would be highly advantageous as no filter is needed. Therefore, the authors think of possible application of their novel thermosensitive porous hydrogels even in reflective full-color displays and sensor systems with wide viewing angles, as well as biochemical sensing technologies and electronic paper.